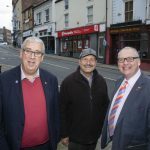 Police boss goes back to the future in Denbigh | News by Wales Express News, People Before Profit! A police boss returned to his old stamping ground to go back on the beat in the Vale of Clwyd. Back in the early 1990s North Wales Police and Crime Commissioner Arfon Jones regularly patrolled the streets of Denbigh as a sergeant based in Ruthin. So he went back to the future for the first in a series of street surgeries across the region to hear the concerns of members of the public and local councillors. He spent the day touring Denbigh and Henllan with Cllrs Mark Young, Glenn Swingler and Rhys Thomas. Police and crime Commissioner for North Wales Arfon Jones with Denbigh resident George Demir and Cllr Mark Young. Mr Jones says, like councillors, he was elected by the public and wants more opportunity to hear directly from community leaders and residents what they want to see police officers doing. He said: “It’s important to hear from county councillors, no one knows their towns and communities better than they do. We do hold public meetings but they are for whatever reason poorly attended. I think people see them as too formal. “I decided the best way was to go out and meet councillors in their communities and to hear first-hand what concerns they had. It’s also a great way to meet members of the North Wales public and talk to them about their concerns. “It’s an open invitation to North Wales county councillors of any political persuasion to meet up on their wards and in their communities to discuss policing and community safety. He added: “I recall the temporary deputy chief constable of North Wales answering a question concerning the perception that there are fewer officers out walking a beat. “He quite rightly pointed out that while it’s nice to see officers out walking and visible that officer will be powerless to prevent a child being groomed on line. “That’s an important point as policing, and the demands on officers, has changed drastically in the last few years. “There is a big issue for me with social media and online grooming and crime. I think parents and grandparents are buying children smart phones and other devices without thinking of security settings. Cllr Mark Young, who is Denbighshire County Council’s lead member for Community Safety and vice chair of the Safer Communities Board, was delighted to welcome Mr Jones to Denbigh. 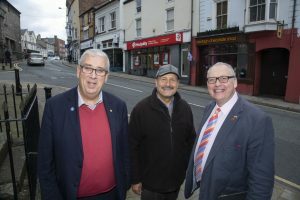 He said: “It’s fantastic that someone as busy as the Police and Crime Commissioner is willing to come out into communities to discuss local issues. “Councillors know their communities and issues can change from ward to ward. There are lots of partners involved with community safety so meeting face to face, especially with members of the public, is so important. “We do have had issues with violent crime and robbery in Denbigh although recently we have seen a number of offenders arrested and put before the courts so we have seen some success and a big reduction in offences. “I chair the Denbigh Partnership and I have welcomed the opportunity to discuss more CCTV coverage for Denbigh with the Police and Crime Commissioner as we have walked around the streets of Denbigh. Among the people the commissioner met was Denbigh takeaway boss George Demir who runs his own fast food outlet on Bridge Street. He said: “I originate from Turkey but came to Denbigh more than 25 years ago and run a kebab outlet in the town. “I explained to the Police and Crime Commissioner my concerns over speeding and boy racers.